As we come to the end of one year and begin a new year, we often become reflective over the past year and recommitted to the new year ahead. We look back and often have regrets because of failures that we wish we could go back and correct. But we cannot and, so we continue on and try to do better in the future. We look at the year ahead and see it as a blank slate, ready to begin recording another milestone of our lives. So, we determine to do better. Often the things we think about for our future revolve around our becoming a better person, a better parent, a better grandparent, a better employee, a better employer, to be more profitable, to have more time for family, to have more vacation time, more time for recreation, to volunteer more time, help others more when possible, or other aspects of living our lives to their fullest and most satisfying, at least from our perspective. There is nothing wrong with making more money, enjoying life more, giving more of ourselves, etc., but should that be the focus of our life? I wonder if we are missing something! Something that God has for us! Think about this for a moment. If we allowed God to write out a New Year’s resolution, a New Year’s commitment, or a goal for us in 2018, what would it be? What is God’s goal for you and me? Would God say, “I want the goal of 2018 for you to be a better child of God, live more fully for Him, or know Him better?” If the all-knowing God, who knows all about our lives, our activities, our thoughts, our motivations, basically all about our 2017 failures and all, if He were to write out our commitment for us for 2018, what would it be? Scripture is full of new beginnings for our lives, maybe we should just look at what God’s Word has to say, and I bet we can determine what God would want for our lives in 2018. Could we say that the verses of Scripture are God’s New Year’s resolutions for our lives? I think so. I think it would be easy to know what He would want our New Year’s resolution to be, simply by examining His word and making application to our lives. Let’s take a look at a number of Scriptures that I think give us an idea of what I am talking about. For instance, maybe you had a rough spiritual journey in 2017, and just want to begin with a fresh start for 2018. Maybe there have been struggles with sin and rebellion. You know that you have made choices to sin against God. What would be a great way to begin the New Year? How about confession of sin, repentance, and restoration? 10 Create in me a clean heart, O God, and renew a right spirit within me. 11 Cast me not away from your presence, and take not your Holy Spirit from me. 12 Restore to me the joy of your salvation, and uphold me with a willing spirit. 13 Then I will teach transgressors your ways, and sinners will return to you. What a powerful way that would be to begin 2018. Known sin confessed, renewed heart and spirit, and a determination to live for the Lord. Or, maybe 2017 has presented some unique struggles in your life. Things that were heavy on your heart and mind, and drained you emotionally and spiritually. It could be family related, it could be physical problems, financial issues, or some other struggle that you just want to put behind you and you need to strive for something better. But you wonder, “Can I really just leave those things behind me?” You might claim this verse. We cannot continually live in the regrets of the past, we must determine to press on to the goal of the upward call. The call God has for every believer to become a child of His, living passionately for Him, and loving Him with all our heart, soul, mind, and strength. But we cannot live in past regrets and be victorious in our future. If we have confessed sin, we need to realize God’s forgiveness for us. Maybe 2017 has been a year that you struggled with things not going the way you planned them. Your plans didn’t come to fruition or at least in the way you had hoped they would. You worry and stress over the outcome of events that you now realize you cannot control. Maybe this verse is the one for you. 13 Come now, you who say, "Today or tomorrow we will go into such and such a town and spend a year there and trade and make a profit"-- 14 yet you do not know what tomorrow will bring. What is your life? For you are a mist that appears for a little time and then vanishes. 15 Instead you ought to say, "If the Lord wills, we will live and do this or that." We certainly should make plans to be prosperous, providing for our family, and living for the Lord. But we need to realize that our best laid plans can be changed in a moment. An accident, illness, financial loss, or any number of things can turn life upside down. But we need to keep in mind that God is in sovereign control and we can only say that we will live and do this or that . . . if the Lord wills! Or it could be that you know what the Lord wants you to do; and you are struggling to submit to His plans for your life. You are unwilling to commit to His leading or relinquish the resources He has put into your hands to accomplish it, or even develop the gift He has given you to do it. Maybe these verses in Jeremiah should be on your heart right now. I think that we often know what God wants us to do, we just aren’t willing to do it. I know that is often true for my life. We know what God wants us to do, but with a thousand and one excuses, we chose not to do what the Lord wants us to do. If we would just call upon Him, pray to Him, seek Him with all our heart, God will give us everything we need to do His will. He has a plan for each one of us. Maybe you need to commit your plans for 2018 to Him. Maybe 2017 was a year that you held tightly to the things of this world, to the ideals and expectations of the world and lived as if the world and its superficial pleasures gave you real satisfaction. But you know there is so much more to life than living for the temporal fulfillment found in the things of the world. Maybe Romans 12:1,2 should be your theme verse for 2018. We may need to let go of some things that we are holding tightly to that keep us from being conformed to His image. Maybe we need mind renewal, a renewal in how we think about this world and all it has to offer. We need to ask God for discernment and direction as to how we can live holy and acceptable lives for Him in 2018. Maybe 2018 brings fear to your heart. Maybe it’s the unknown events and outcomes, maybe it’s the circumstances you will be called upon to face in life, or maybe there is something you know you need to do, and honestly, you are fearful about the outcome. Maybe what God said to Joshua should be your theme verse for 2018. 8 This Book of the Law shall not depart from your mouth, but you shall meditate on it day and night, so that you may be careful to do according to all that is written in it. For then you will make your way prosperous, and then you will have good success. 9 Have I not commanded you? Be strong and courageous. Do not be frightened, and do not be dismayed, for the LORD your God is with you wherever you go." There are many things that we need the courage of Joshua to face. Image if God called you to lead over 2 million people into an unknown land! No matter what God has called us to do in 2018, we can live in strength and courage, not fear! You say, “But what if something bad happens?” We need to determine to follow the Lord no matter what happens, good or bad. Maybe if we could just understand that God works all things out, good or bad for His purpose, maybe that would alleviate some of our fears. 8 And we know that for those who love God all things work together for good, for those who are called according to his purpose. Maybe 2017 was a year you doubted God, you didn’t think He would give you direction and leading. So, you chose to ignore His Word and didn’t take time to seek His face in prayer. Maybe it was a year of trusting in yourself rather than God. But you realize now that your own understanding of things did not lead you well. Maybe these verses from Proverbs should be emblazoned into your heart and mind. 5 Trust in the LORD with all your heart, and do not lean on your own understanding. 6 In all your ways acknowledge him, and he will make straight your paths. 7 Be not wise in your own eyes; fear the LORD, and turn away from evil. 8 It will be healing to your flesh and refreshment to your bones. It seems as though our days slip by us like fleeting moments and now at the end of 2017, we say, “What have I accomplished for God.” Procrastination, unplanned days, results in unaccomplished goals, dreams, or even New year’s resolutions. If we see 2017 as a year of things not really accomplished for the Lord, listen to Psalm 90. 10 The years of our life are seventy, or even by reason of strength eighty; yet their span is but toil and trouble; they are soon gone, and we fly away. 11 Who considers the power of your anger, and your wrath according to the fear of you? 12 So teach us to number our days that we may get a heart of wisdom. We need to see God’s purpose in each day of our lives. When we get up in the morning, ask God for direction and guidance, ask God to help you see something accomplished for Him, and ask God to lead someone into your path that you can minister to. We need to number our days, make them count. You see, over and over in the Word of God we find verse upon verse that tells us about how to begin again, start fresh, and live for God no matter what our 2017 looked like. We could read verses like this all afternoon. We may even take some of them to heart and make renewed commitments to the Lord. 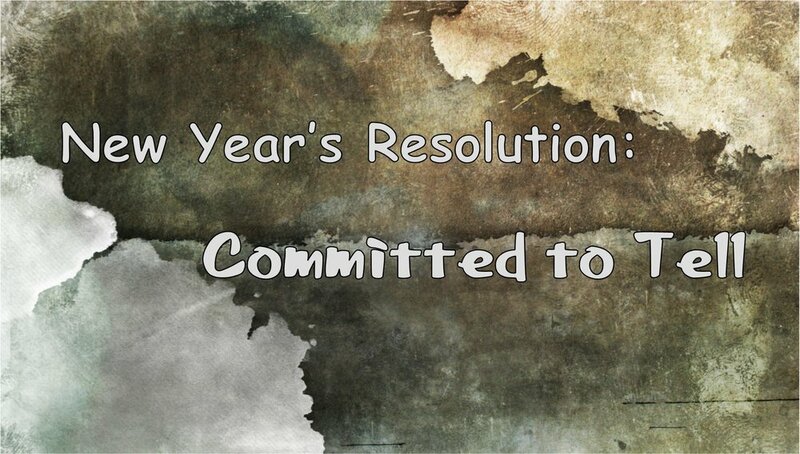 But we must choose to apply that resolution, commitment, or renewed goal to our lives. It doesn’t just happen on its own. I want to close with a challenge of renewed commitment in an area that I know I struggle in and I believe many of you also struggle in. It is something that comes right from the text of Scripture and I believe this would be a New Year’s Resolution that God would have each of us make as a commitment to Him for 2018. Maybe 2017 was not a good year for telling others your story, about your salvation story, about how Christ has saved you from your sin and your eternal destination of separation from God in a place called Hell. Maybe there were missed opportunities to share the glorious Gospel message of salvation. We have clear instruction from the Bible about witnessing to others, don’t we? 19 Go therefore and make disciples of all nations, baptizing them in the name of the Father and of the Son and of the Holy Spirit, 20 teaching them to observe all that I have commanded you. And behold, I am with you always, to the end of the age." What a promise. He is with us always even those scary moments when we talk about Him to others as we make disciples. When I think of verses about witnessing, one passage that often comes to mind is Jesus’ interaction with His disciples right after He spoke with the Samaritan woman at the well in Samaria. During the time Jesus was talking to the woman, His disciples were in in town getting something to eat. When the disciples came back to Jesus and found He had been talking to this woman they marveled, because she was a Samaritan and Jews had no dealings with Samaritans. After her conversation with Jesus, the woman had gone back into town and told everyone she knew about Jesus and told them to come and see this man, Jesus. Meanwhile the disciples were trying to get Jesus to eat and He told them he didn’t need to eat, that His food was to do the will of the Father. For Jesus, the work of telling people about salvation was more important than eating, even telling a Samaritan woman. When Jesus looks up and sees the Samaritan woman coming from town toward them with the people that she had told about Him, Jesus says something that is powerful. The fields around them were still four months from harvesting time, but Jesus compare the people coming out of the city with the Samaritan woman as a field of souls ripe for harvest. Let’s read these verses. The point is simply that many Samaritans came to know the Lord because of the testimony of this woman. When was the last time we shared our testimony with someone? In 2017, did anyone hear from our lips how the Lord saved us? If not, why not? Shouldn’t we be planning and committing to sharing the Gospel to others? Or is it easier just to ignore what Jesus has told us? We should have a concise testimony of how the Lord saved us ready on our lips. We should have tracts, books, or other information at our finger tips ready to give them. But usually we don’t. Why we are NOT planning on sharing the gospel. That is what we are doing if we are not prepared. Could this be the resolution or commitment that God has for you and me in 2018? If I asked you to think of someone you know who is unsaved, who pops into your mind? This could be your commitment to the Lord this year, to share with that person your testimony of salvation! If God is allowed to write a New Year’s resolution for you, might this be part of it? Will you make a commitment to Him to share the gospel with someone in 2018?